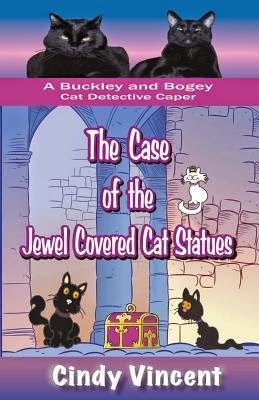 Buckley and Bogey, Cat Detectives, find their next big case with the Buckley and Bogey Cat Detective Agency to be their most complicated ever! It all starts when someone hides a mysterious package in their Mom's antique store - in the middle of the night! Of course, the boys find it, and put it in a nice, safe place, until they can open it . . . and, find the rightful owner. But that's when a whole bunch of suspicious people show up in St. Gertrude, and every single one of them seems to be after that package! Holy Catnip! Plus, everything happens just when a priceless, jeweled statue collection goes on display at the St. Gertrude Museum. Missing from that collection are two jewel covered cat statues that disappeared almost a hundred and fifty years ago. But soon Buckley and Bogey wonder how long those statues will stay missing. Because this is one case that really keeps them on their paws! From a trip to the Museum, and to an old church for the Blessing of the Animals; and from dinosaurs to diamonds, they end up dodging shady suspects the whole time. It sure helps to have their friends with them, especially when the bad guys make a beeline for boys. That's because it becomes very clear, very quick - the priceless cat statues aren't the only cats those crooks are after! Holy Mackerel! While this book is geared more towards the early middle school years, it's one that I very much enjoyed reading. I appreciated how each of the cats had their own personality and yet worked together to solve crimes and to take care of their families. This is one mystery that had me reading right up until the last page because the criminals were unpredictable and the sleuths weren't giving up until the mystery was solved. The storyline flowed smoothly and as I said, each character had their own personality and it was well defined. If I had one complaint, it would be that our narrator needs to mix up his catchphrases a bit. He has a tendency to repeat the same one an awful lot. But, he's a growing boy and perhaps as he gets older, his vocabulary will expand. I'm not going out on a limb to say this is a super cute, fun book that will delight readers and cat lovers alike. Thank you so much, Katie, for hosting us on your site and for your wonderful review. Buckley is here sitting right in front of my computer monitor and he sends hugs and wet nose kisses your way! Holy Catnip! Also, don't forget to enter the Rafflecopter giveaway on Buckley's site at BuckleyandBogey.com. Bloggers can win, too! Thanks again, and keep up the wonderful work with your blog.